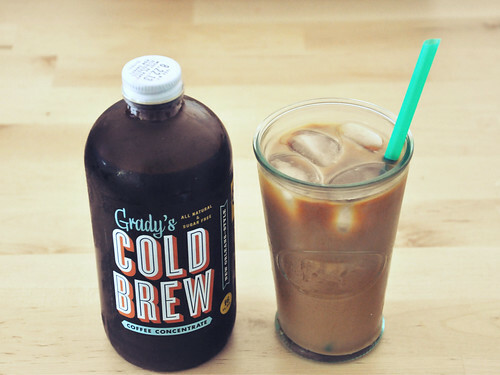 Grady’s Cold Brew is a New Orleans–style coffee concentrate that’s brewed and packed into nifty brown bottles in Brooklyn, NY. There’s no sugar in Grady’s but it’s brewed with chicory which lends a natural sweetness. And it tastes awesome with milk. You can find Grady’s in 16 ounce bottles or 32 ounces bottles which have four and eight servings respectively at a variety of stores around the city. They’re available at Union Market, Whole Foods and Fairway. The bottles retail at Union Market for $7 for the small and $14 for the large and that's the best price I've seen around the city (let me know in the comments if you've seen better!). If you return the large bottles to participating stores you get $2 off your next purchase, making your next fix even cheaper. Pretty sweet.